When thinking brings pleasure. When thinking brings pleasure? 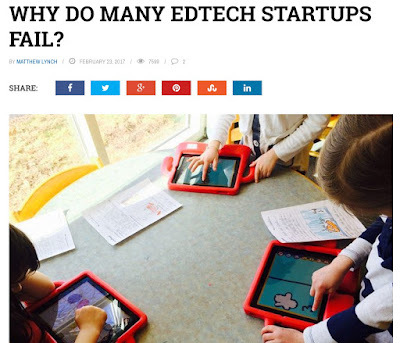 : Why Do Many EdTech Startups Fail? Really! All these reasons are correct, but they do not play the major role, they all are secondary. The main reason for Ed startups to fail is because they ignore the nature and the history of education – as a human practice. They act like this is the first time in the history of the world when innovations are entering education (well, trying to enter). It is not. Thinking that only shows the ignorance of the “thinkers”. There have been many waves of innovations. Every new device, or gadget, or a technological approach (a TV set, a tape recorder, a video recorder, a computer, the Internet, to name a few) has been seen as a tool for revolutionizing education. So far, innovative waves come and go, but the revolutionizing has not happen. This situation provides a very clear illustration to a rule that, when one does not learn from history one is doomed to repeat the same mistakes. That is what is happening with those failing EdTech startups. They do not learn from the history of education. They do not even learn for the history of their peer trying to change education. And - naturally - they repeat the fate of all previous startups – they fail, too. Do you know what teachers need? Do you know what teachers want? Do you know what teachers can and cannot do? This is a quote from my post “Will the Yidan Prize Affect the Evolution of Education? Too Soon to Say” (http://www.cognisity.how/2017/03/yidanprize.html). “The challenges education faces today have been facing education for decades. Education has “survived” many waves of innovations, so to speak. Big corporations and small startups develop a vast amount of various teaching tools. Teachers are flooded by innovative tools. It is like you buy a car, but instead of a car you get a kit, a collection of parts, and you need to assemble it, like a chair from IKEA.” And that is the best case scenario. Or another analogy may be useful, too. Teachers are like people who want to buy a car. But everyone offers them only parts, someone offers a windshield, someone else offers wheels, etc. What makes it even worse, all those parts don't fit with each other! 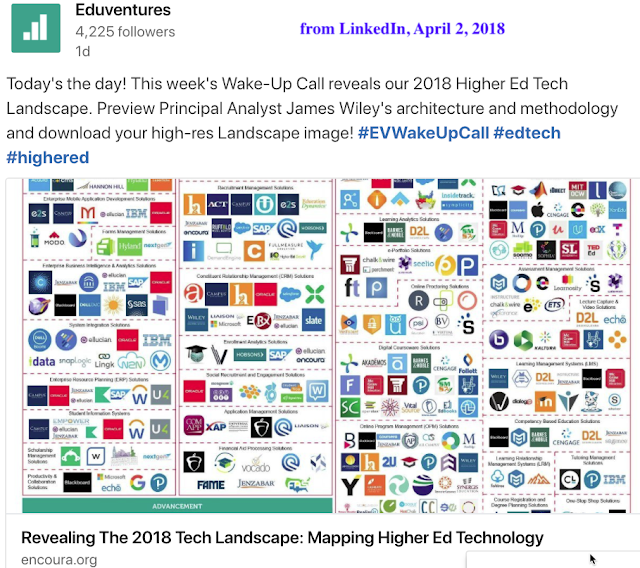 If you want to start an EdTech startup, start from asking yourself a question, what can you do different from what huge and wealthy organizations have been doing for decades (but so far no one speaks about it, e.g. XQsuperschool: http://www.teachology.xyz/xq.htm)? And one more thing, try to follow the strategy which had led Steve Jobs to his success. He said that acting "hey, we can do this, now let's sell it to consumers" is a dead end. But this is how all EdTech startups act today. According to Jobs, first they need to learn what consumers - teachers - really need and want, and then offer them the product. Probably, venture capital firms seeking to invest in educational startups should also keep Jobs' lesson in mind. EdTech startups fail because they have a lot of Tech and no Ed. As the result, they don't know the psychology governing teacher behavior. For example, often there is a big gap between what people say they need, and what they really need, indeed. That includes teachers. So, all focus goes on the technical part of project. Keep in mind, all failed startups have been backed by successful VC entrepreneurs. It means that their backers have exactly the same mentality (click here for the one of the recent examples or here for another - with MUCH more money). When they start their educational project they may have some advisors from the field. But how do they know those people have the whole picture of the Education as a human practice? Because, currently, there is no science of education (there is a scientific field! but that is NOT a science yet). 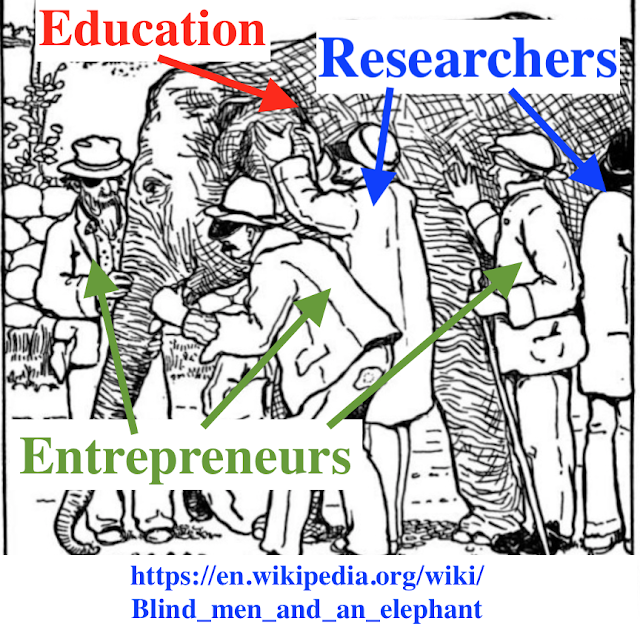 The very approach they used to propel their startup to a prosperity will NOT work in education. 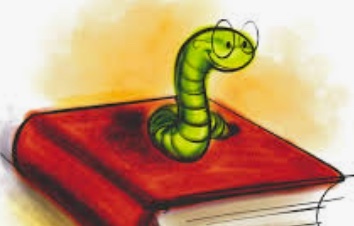 Of course, if you through enough money on one local educational entity that will work (under the right guidance) but claiming "I will disrupt education" just shows how little she or he knows about learning and teaching. Education starts, propels, and changes from/by/via a deep and serious study. Everyone who wants to "disrupt" education should start from the questions - what is the mission of education as a human practice. (BTW: if an "expert" cannot give a clear answer - don't hire him or her). To get a better understanding how VC and similar entrepreneurs work, I like to observe who Y Combinator is working and listening to what Mr. Sam Altman is saying. It helps to crystallize the psychology of a venture capitalist. First, of course, one needs to have money. Then one starts selecting targets to invest. 5. team members are articulate and seem know what they are doing, what they want, and what to do in the near future. A very similar approach is adopted by the NSF to advance science. However, the history of science demonstrates that a breakthrough usually does not follow this pattern. The most well-known (but not unique) example is the “Manhattan Project”. (basically, after this step the team makes a transition into the step #1 of the previous approach). many details, parts, entities) but doable project, i.e. it will require a lot of doing but not a lot of thinking. The "product" (the goal) will definitely be achieved (but there is a chance the consumer will not like it as much as it was hoped). The latter approach does not guarantee that the expected product will be developed (the goal will be achieved). The project is complex, but also complicated (i.e. requires a lot of thinking; which requires a special type of management). However, This is how breakthroughs come to a life. This is how a field of human practice becomes disrupted. Otherwise, everyone would be able to see this product (goal) and be trying to get to it ahead of everyone. But the disruption is called that because no one could see it coming. This is the example of a technocratic approach. 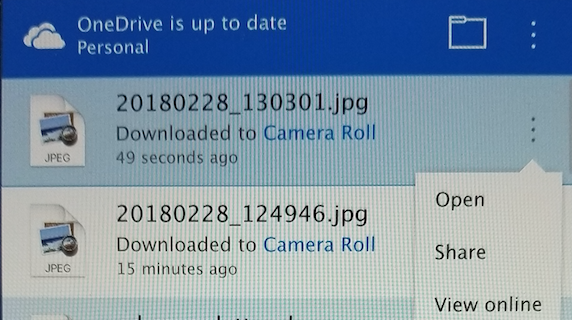 The designers of the Microsoft OneDrive pondered, what would people want to do with files when they get downloaded from the cloud on the hard drive? Well, they didn't think of the obvious option - GO to the file, so now, everyone gets to click it through (BTW: one of the reason why writing a good instructive manual is not an easy task). This is what happens when a product for people design by the technocrats. It is not a big deal for a giant like Microsoft, but for a small startup it may cost its existence. For a large interpreter investing into an educational project it may cost unnecessary losses. I have seen again and again numerous examples similar to this one (for example, check this 14-s video which shows a weird incompatibility between such giants like Apple and Blackboard). Teacher: "I would like to buy a car"
Eduventures: "We have no cars, but we can sell you a kit - you can assemble your car yourself! Teacher: "OK, I think I can give it a try"
Eduventures: "Yeah, one more thing. All the parts are made by different manufactures who do not communicate, so the parts may not fit with each other, but - hey - it is better than nothing! Yes?" Teacher: "Well, at least I will be doing something new, maybe I got lucky and and it will help me to make something which would move me a little bit faster than I walk now. Plus, it will demonstrate that I am trying new things." This is an example of a wishful thinking ("just give teacher/students tablets/apps and they will learn ten times more/better") v. the reality. Quote (one of many worthy): "Many apps, independent of how long or often students use them, have no relationship to learning outcomes. And the majority of purchased licenses don’t get used. "I was very predictable. When EdTech companies will learn that they have to be more Ed and much less Tech to succeed with educating children - not AI, robots, or animals - their favorite audiences.